When the data center your organization relies on has an emergency, you can’t afford any delays. 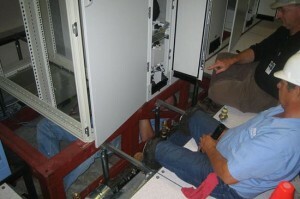 A call has to be immediately placed to your data center maintenance firm for an emergency response. Your organization’s data center is one of its most valuable assets; any sudden maintenance crisis has to be treated as a priority emergency. All the information contained in a data center is also valuable, possibly incalculably so. If anything ever goes wrong, you need to know exactly who to call. When your data center experiences sudden loss of power, system failure, or loss of physical integrity, the first thing you have to do is call your data center maintenance emergency response team. If you purchased a maintenance plan with the data center design company you purchased your centre through, then you have nothing to worry about. Simply put in a call to their twenty-four hour help desk or to the emergency assistance line. The service firm will dispatch a team in no time. Responding to an emergency maintenance call consists of a number of steps. The process begins when one of your data center team members notices a problem. An alarm may sound on their monitoring station or they may notice something when performing a visual check of the area. As soon as a problem has been detected, the data center team member will call the emergency response line at the data center maintenance company you are partnered with. They will relay all the necessary information to the emergency response center; the response center will then dispatch a team of technicians to your location. Once there, the team will spring into action. If necessary, a rapid assessment will be conducted to determine exactly where the problem is located and how it can be fixed. Depending on the nature of the emergency, this assessment may be completed in only minutes or it may take a little longer to complete. It is very important that the maintenance team diagnose the problem correctly in order to for the repair to be done correctly. If the assessment process is rushed or skipped entirely, the repair may not take or might even be placed in the wrong location. However, if you have purchased a service plan from a professional data center maintenance firm, you can be certain that the repairs will be handled correctly. They are experts at all aspects of data center management, so you can trust the work they’ll do for you. Once the repair has been completed, a second assessment will be run to make sure that the maintenance has been successful. Your service company will follow up periodically to make sure that the work they done has remained in place and that no additional maintenance needs performed. Thanks to the fast action of the emergency response team, your valuable data center and all its information has remained intact. You can trust that your organization’s data center will last for many years. However, in order to keep it running well, regular maintenance checks must be performed. Preventative maintenance is one of the best things you can do to protect this valuable asset. However, if an emergency situation develops, you need to know exactly who to call. The emergency response team from your preferred data center maintenance firm will go to work immediately to protect your data center from serious damage. This entry was posted in data center maintenance and tagged data center emergency service, data center maintenance. Bookmark the permalink.